There’s nothing worse than a shiny bike with a tatty old bottle decorating the down tube! 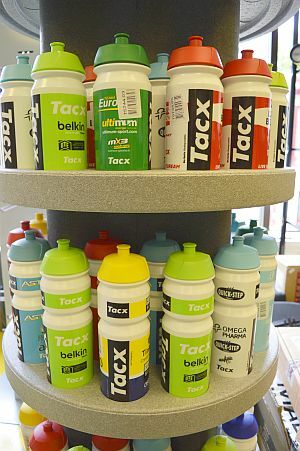 We’ve just received this great range of bottles from Tacx, with many of the world’s leading pro Road teams represented. So there are colours to match your bike or kit. Large bottles are £6.99 and medium bottles £5.99, so they’re a great way to smarten up your look for next to nothing. Come into the shop and have a look at the big new display carousel by the door. And don’t forget to check out all out Tour de France related souvenirs, gifts and kit including T-Shirts, KOM summit markers, Grand Tour Bottles and many other gifts. This entry was posted in Latest News on June 10, 2014 by pedalsportclub.